In September 2001, Mark Cuban launched HDNet, a provider of high-definition news, entertainment and sports programming. Cuban started his own computer consulting firm, MicroSolutions soon after college, which he later sold to CompuServe. In 1995, Cuban and his partner Todd Wagner co-founded Broadcast.com, an Internet service that provided streaming audio and video of live news, radio, television and sporting events. Broadcast.com went public, and was then purchased by Yahoo in 1999, making Cuban one of the wealthiest people in the country. In January of 2000, Cuban used all those bucks to buy the Dallas Mavericks NBA franchise, becoming the only owner in team sports to encourage fan interaction through email on his own personal computer. He has also partnered once again with Wagner to create 2929 Entertainment, a holding company that owns 100 percent of Landmark Theaters, Magnolia Pictures Distribution, and Rysher Entertainment, and holds a stake in Lions Gate Entertainment. He is not known as a quiet man. The billionaire entrepreneur takes a victory lap (or two). Deliberations took three and a half hours. A lot of upside for the QR-code startup Scan. 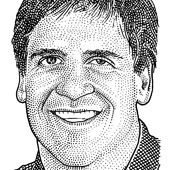 Opening arguments in the insider trading trial of billionaire investor Mark Cuban began here Tuesday with government lawyers portraying the defendant as a ferocious competitor who, with an unfair advantage over the investing public, sold shares illegally. Are the Web’s pipes really up to delivering live football, to millions of TVs, at the same time? A federal judge in Dallas has denied a request by Dallas Mavericks owner and billionaire entrepreneur Mark Cuban to dismiss an insider-trading lawsuit. People like bundles. People don’t like to work for their entertainment. They’ll pay a premium if it saves them time. The billionaire gets candid on a Reddit “Ask Me Anything” page. Little Bird goes deeply and geekily into the world of online influence. Can Yahoo Turn Itself Around? Viral Video (And Perfect Casting): Mark Cuban on "Entourage"
If This Is Age of Web Video, Who’s Buying All Those TVs?